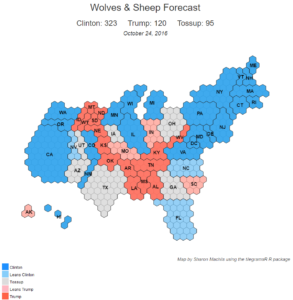 Home » Electoral College » Electoral Map 10/24: Texas? The Wolves and Sheep electoral college map looks much as it did last week with one big exception: Texas is now a toss-up on the strength of three recent polls showing Donald Trump with a slim 3-4 point lead over Hillary Clinton. I’m not suggesting that Clinton will win Texas, which is a large, expensive and complicated state where no Democrat has won statewide office since Ann Richards was governor during Bill Clinton’s administration. Instead, I see the closeness of the race in Texas—where Clinton has been steadily catching up to Trump over the past few weeks—as emblematic of how the presidential race appears to be slipping away from the Republican nominee. Along with Arizona, Georgia and Utah—all tossups—Clinton is systematically expanding the electoral map in the election’s final weeks by contesting traditional red states where Trump is underperforming. This week should bring an avalanche of national and statewide polling that reflects the state of the race following the third and final debate, and I will update the map to reflect these results when they become available.